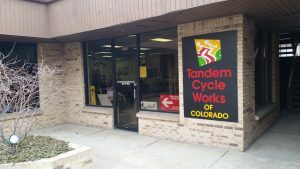 Tandem Cycle Works is located in one of America’s premier cycling cities: Denver, Colorado. Tandem bikes are what we do… all we do. 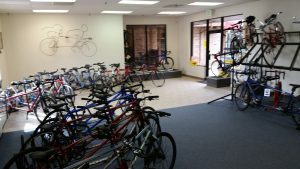 When Tandem Cycle Works opened in 1994, there was one goal in mind — to create a retail environment where tandems were the focus, rather than an afterthought. As the sport has grown, so has our business. We are a leading dealer for Co-Motion and Calfee tandems. To put it simply, we sell more tandem bicycles than any other bike shop. How do we do it? With personalized, knowledgeable service and support. A logical outcome of specialization is expertise. And, since we focus on tandems exclusively, we have a level of knowledge that takes the guesswork out of a tandem bike purchase. When making a purchase like this, our experience is important in helping you get the right bike to meet your personal needs and desires. We don’t just SELL tandems, we are active members of the tandem community. We typically log several hundred miles a year together. We participate in tandem rides and rallies at home and throughout the United States. Take advantage of our knowledge, experience, and love of the sport when considering a tandem bicycle purchase. We carry all of the best tandem manufacturers in the business. At our store, you can see and test ride bikes from: KHS, Calfee Design, and Co-Motion.